Which team is the best at 3-on-3? Which NHL team is the best at the 3-on-3 format? It’s something I’ve wanted to look at for some time, particularly since it’s a new (and unbelievably entertaining) wrinkle to the sport. The problem is that it’s a fairly infrequent feature – one that’s only deployed in overtime settings and the extremely rare moments where both teams have taken multiple cluster penalties in regulation. Now, at the halfway mark of the season, we’ve had a chance to see most of these teams a dozen times or so in the 3-on-3 format. I’m curious to dive into the numbers to see both which teams have success on the wide-open ice, and which teams have struggled to adapt. The leaders in the clubhouse – at least by pure goal differential – are the Calgary Flames. Bob Hartley and company have excelled in this format, likely the result of young, agile skaters getting more time and space to operate in the offensive zone. Johnny Gaudreau has been the ignition of this attack, with a league-leading seven points (three goals and four assists). Don’t sleep on the high-flying attack in Chicago, either. The Blackhawks have actually scored at a slightly better per-60 rate than the Flames, though they’ve also conceded more defensively. 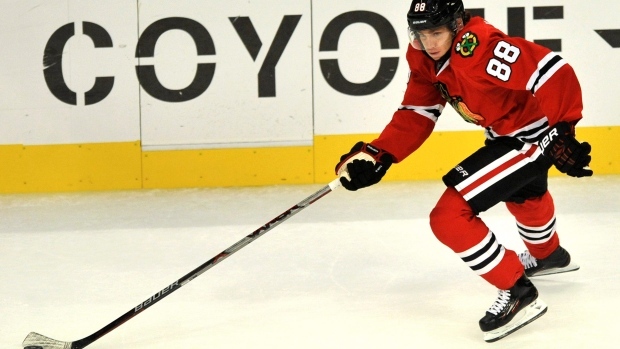 Their 3-on-3 attack is led by Patrick Kane (four assists) and Jonathan Toews (three goals) – which probably comes as very little surprise. At the other end of the spectrum, Anaheim, the New York Rangers and Toronto that still haven’t found the back of the net. The rest of the teams are situated below. I think the most curious team by the goal counts here is Nashville. You’d think that a team with such a mobile blueline and a few high-level skill guys like Filip Forsberg, Mike Ribeiro, and James Neal would provide an average to slightly above average 3-on-3 unit. Instead, they carry the second-worst goal differential, ahead of only Minnesota. Since we are talking about a limited number of minutes in the analysis here, it’s value-added to also look at the underlying numbers to see if any other team pops performance wise. I’ve went ahead and scattered metrics with more voluminous data sets – each team’s shot differential in the 3-on-3 format and each team’s scoring-chance differential in the 3-on-3 format. Are Calgary and Chicago still the league’s most dominant clubs? Whoa, Florida! The Panthers didn’t really register on our goal-differential radar, mostly because they’ve scored little and conceded little at 3-on-3. But perhaps we should be paying more attention to what they are doing. They are controlling about 70 per cent of play, far and away the best number we see from any team across the league. “That’s the way we’re going to do it,” Trotz said. “I really don’t care what everybody else wants to do. One of the things we felt that it’s about puck possession. If you don’t have possession, then you’re defending right away, and we felt that the best way to defend is putting defenders out there. They’ve mixed and matched strategies and combinations for most of the year, but it’s hard to argue with their success so far. They have just two players with more than one point (Evgeny Kuznetsov and Alex Ovechkin), but the defence has been stifling. By War on Ice’s count, they have given up only two ‘dangerous’ scoring chances in 22 minutes of play. Considering the pace of 3-on-3, that’s almost impossible to believe. And, to close on the other end of the spectrum: perhaps Nashville does need to reconsider what it’s doing in overtime? 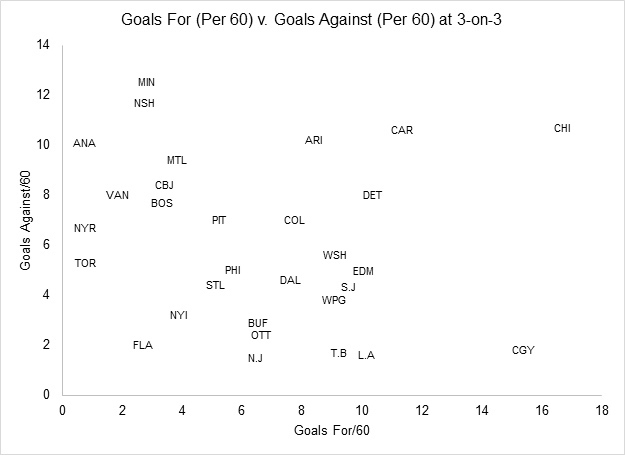 The goal differentials, as noted earlier, are ugly. 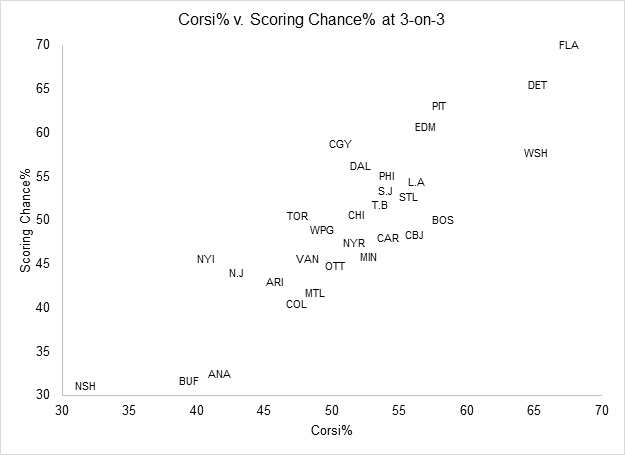 But the shot differentials and scoring chance differentials are just as brutal. With how critical the extra point is – and how critical Nashville’s position is in the Central Division, just three points up on last place Winnipeg – it’s probably something coach Peter Laviolette should consider analyzing and overhauling. Calgary. Chicago. Florida. Washington. Widely varying player personnel. Extremely disparate 3-on-3 strategies. And yet, I think you can make the argument that any of these four teams is the king of the 3-on-3 format. So, who do I crown? I think the season-to-date answer is Calgary, but it’s razor close. I’m open to arguments. Who do you think is the NHL’s best 3-on-3 team?